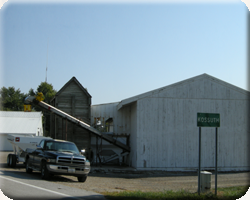 The United Equity location in Kossuth is a full service crop protection and fertilizer facility. Our grid sampling program samples by soil type, grids or management zones to best manage your soil’s needs. Our modern precision agricultural equipment is capable of Variable Rate Application of both lime and dry fertilizers and we can tailor a program to fit your yield goals and nutrient needs for each farm and field. Stop by or call our Kossuth facility at 419-657-6788 to discuss how we can best meet your needs.